The New Britain Common Council wants the city to join other communities across the country that have banned single-use plastic bags. On Wednesday, it forwarded a resolution to the Committee on Administration, Finance and Law to phase out the bags that are commonly used by grocery stores, drug stores and other shops. The new ordinance would prohibit retailers from selling, providing or distributing non-reusable plastic bags in their establishments. The resolution would also prohibit retailers from providing paper bags unless they are recycled or recyclable in some way. Retailers wishing to provide paper bags to customers must sell them for $0.10 each. According to the Center for Biological Diversity, single use plastic bags can take anywhere from 20 to 500 years to decompose in landfills. Americans use 100 billion plastic bags a year. Of those, only 1 percent of bags are recycled. Because the percentage of recycled single-use plastic bags is so low, the remaining bags end up in landfills or polluting waterways, oceans and land. Up to 80 percent of plastic pollution enters the ocean from land, the website noted adding that 100,000 marine animals die as a result of plastic pollution each year. The bags don’t break down completely but instead photo-degrade, becoming microplastics that absorb toxins and continue to pollute the environment. If the proposal becomes a law, a number of individuals and businesses could be impacted. For supermarkets such as Big Y, it may not be difficult to adapt to the proposal since the chain is also aiming to ban single use plastic bags in its 70 establishments by the end of 2020. Some local business owners don’t mind adapting to the change because they see it as a way to help the environment. 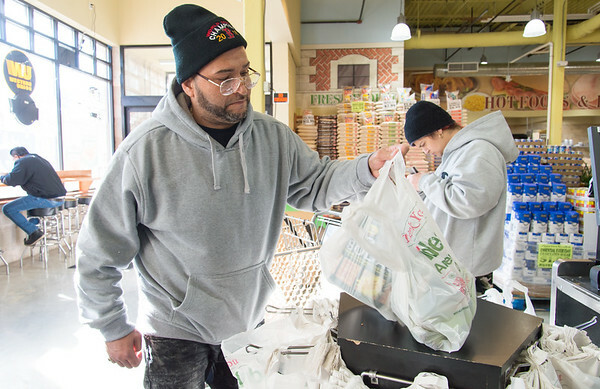 JD Diaz, owner of C Town Supermarket in New Britain said that prohibiting retailers from using non-reusable plastic bags is a good idea. If the law passes, the question some retailers may ask is what do we do with all of the single use bags we already have? C Town Supermarkets seem to already have a plan. Tracy Schneider, owner of Bricks and Minifigs in Southington, doesn’t think that a plastic bag ban will affect her business. She said sometimes they use cardboard boxes instead of bags if someone buys larger items. Other local retailers are not too happy with the proposal. Naji Jahas said his family has three different businesses in the city; one of them is J & J Pawn Shop. Walgreens has had to deal with similar prohibitions in other parts of the country. Other Connecticut cities and towns such as Stamford and Norwalk have advanced plastic bag ban ordinances. A reusable cloth bag costs a $1 at the Dollar Tree, but even cheaper deals could be found online. Joe Grabowski said he agrees with the proposal as he walked into the Dollar Tree. “It’s less bags, each time I get too many, I don’t know what to do with them,” Grabowski said. Vilma Miranda, on the other hand said she doesn’t agree with the proposal. Miranda is aware that the bags could affect the environment. “But we still need them,” she said. The conversation didn’t go too far before Ivelisse, Miranda’s daughter stepped in and convinced her of the opposite. “That’s better, no single use bags,” Ivelisse said. Skyler Frazer contributed to this story. Posted in New Britain Herald, Business, General News on Friday, 25 January 2019 18:02. Updated: Friday, 25 January 2019 18:04.